Storage is always in high demand with any type of RV. 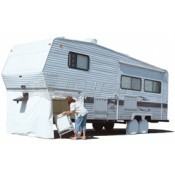 With a 5th wheel skirt you can get extra storage out of space that is usually wasted. The 5th wheel skirt attaches to your 5th wheel overhang to create a neat little storage spot for outdoor furniture and bikes. The skirt comes with snap attachments and tent spikes for added support. Always looking for more space in your 5th wheel, but not making use of the space under your overhang? Put a stop to that now by ordering the ADCO 5th wheel skirt. It is made out of a weather resistant vinyl that is made to last. If you have a lot of outdoor furniture or several bikes or even just a lot of general equipment to store getting a 5th wheel skirt is the right solution for you. It gives you extra storage with a fairly small investment of time and money. Even in a home, storage is often a hot commodity. You may need to build expensive storage units or buy a storage shed that may or may not last for long. Either way they take up usable square footage but with the 5th wheel skirt you are making storage out of otherwise unusable space. You could try the do it yourself route but that’s significantly more difficult and time consuming. When you buy a 5th wheel skirt from Dyersonline.com we have done all the vetting for you, all you have to do is order install and enjoy. The screw-in snap fasteners work well and are simple to install. There is a zipper on all three sides to allow for easy access to your supplies. So don’t spend another day with wasted storage space get a skirt for your 5th wheel and optimize your space.